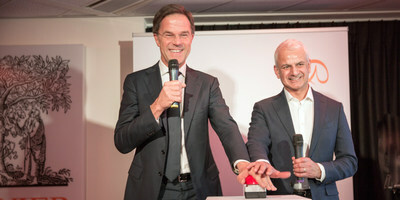 Dutch Prime Minister Mark Rutte today opened a new TechHub at the Amsterdam global headquarters of information analytics business Elsevier, a subsidiary of RELX Group. The TechHub will enable world-class talent to combine large data sets with global technology platforms and advanced analytics to create digital tools that help researchers and health workers make better decisions. The Prime Minister's visit was part of his tour today of several prominent and innovative international technology companies and start-ups operating in the Amsterdam region. The Prime Minister today thanked Elsevier CEO Ron Mobed for hosting this special visit. Mr. Rutte said: "It is all very impressive to learn more about RELX's and Elsevier's dedication to using information and top-tier technology to add value to Dutch society. I see a parallel between Elsevier's centuries' old history and that of the Dutch republic, which came about in a spirit of liberty and the freedom to publish. That same spirit I witness here today. So I am proud to open Elsevier's TechHub today." Ron Mobed, CEO of Elsevier, said the Dutch Prime Minister's visit was a recognition of RELX's and Elsevier's continued dedication and contributions to Dutch technological innovation. "RELX Group proudly contributes to the Netherlands' standing as a global leader in innovation by investing heavily in the Dutch knowledge economy," Mr. Mobed said. "Elsevier, a Dutch company by origin, already has a strong presence here in the Netherlands. It is a natural extension of that presence to build out a pioneering technology hub at the same location." The TechHub is Elsevier's center of excellence, where world-class talent will work on developing innovative technologies that will allow Elsevier to turn information into actionable knowledge for users in science, healthcare and government sectors. In 2018 the TechHub grew by over 50 people, with Elsevier targeting an additional 80 or more new hires into the organization in 2019. Elsevier is planning to have around 200 technologists based in the Amsterdam office by 2020, demonstrating the business' commitment to attracting and retaining high-quality tech talent to the benefit of the Dutch knowledge economy.